Peppermint tea is an herbal tea that you can enjoy at any time of the year. Hot in the winter, iced in the summer, this minty beverage is considered a cure-all, but it is also enjoyed world-wide simply for its wonderful flavor. Loved and known around the world as a tea with a multitude of health benefits, mint tea has found its way to the hearts and cultures of many tea drinkers. Fresh and healing, this herbal infusion is a great favorite both on its own and when blended with teas and other herbs, enhancing the flavor and health benefits of both. Learn more about this cooling and soothing herbal tea! Peppermint (mentha piperita in Latin) is a perennial mint native to the Mediterranean region that has long spread is cultivated around the world, particularly in Europe and North America. 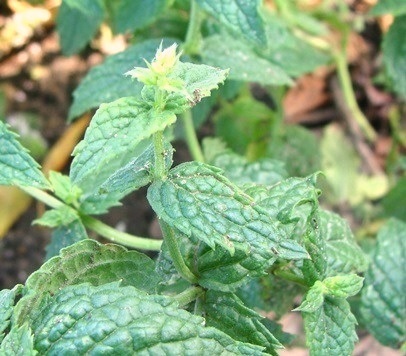 This particular species of mint is actually a hybrid, a cross between water mint (mentha aquatica) and spearmint (mentha spicata) which occur naturally in the wild. The peppermint plant may reach heights of 30cm to 90cm and likes warm and moist climated. Its leaves are about 4cm to 9cm long and are green with toothed edges and a slight fuzz on the surface. In the summer months, this herb blooms small purple flowers that, along with the leaves, may be used to make an herbal infusion. This is a very resistant plant that sprouts and spreads quickly. Unchecked it will spread through your garden and sprouts will invade neighboring flower pots. There is a long tradition of use of peppermint tea, medicinal or otherwise, dating back to thousands of years ago. It is known that people in Ancient Egypt, Greece and Rome would use this herb as a flavoring agent or for ceremonies. Peppermint was also greatly valued for its medicinal properties. It remained for ages as an important folk remedy to bring relief for gastric problems and soothe pain spreading throughout the world for its wonderful benefits. Today peppermint herbal tea is still offered in the Middle East as a welcome drink when guests arrive and all over the world people resort to this tea when feeling poorly or to add a cooling and refreshing touch to many dishes. Due to its igh menthol content, peppermint found its wat to the cosmetic and hygiene industries, being found in shampoos, skin care products and toothpastes to name just a few examples. It is also great valued as a flavoring agent for ice cream, confectionary and chewing gum. A tea made with peppermint contains menthol, a powerful therapeutic component. It also contains calcium, iron, magnesium, phosphorus, potassium and vitamins A, B-complex and C. It is also rich in flavonoids, rosmarinic acid, tannins and carotenoids. Drinking a cup of this tea regularly may provide you with a number of health benefits making it a revered cure-all. The main benefit of peppermint tea is its ability to decongest the nasal and bronchial passages. It is ideal to drink when you feel a cold or flu coming on. Its soothing and healing action is said to treat infection in the upper respiratory tract and help you to breathe better. The menthol content in peppermint makes this a great herbal tea to ward off colds and bronchitis right at the onset of the disease before getting too serious. With honey and lemon, this is truly a decongesting tea breaking up phlegm and mucous. It may even help prevent the first symptoms of tuberculosis. If your temperature begins to rise drink a cup of peppermint tea to let the menthol cool you down as well as possibly fight the inflammation and discomfort. This tea may be given to older children, but be aware of possible allergies. The menthol content of this tea may also help to treat a sore throat, alleviating coughs and reducing the pain and infection associated with laryngitis. Peppermint tea is often viewed as soothing expectorant, helping to break up bad coughs. Add a bit of lemon and honey to help. Peppermint tea is also considered an antispasmodic, which is ideal to help those who suffer from asthma attacks, alleviating mild attacks and controlling muscles. If you suffer from hay fever (allergic rhinitis), then have a cup of peppermint tea to alleviate congestion and stop the urge to keep sneezing. Its antihistaminic properties may help calm season allergies in a natural way. You may turn this tea into an inhalant. Using a vaporizer peppermint tea may be breathed in to slow decongest and clear your nasal passages and relieve an irritating cough. Peppermint tea is ideal to bring relief to stomach problems, such as heartburn, indigestion or nausea. It is said to improve digestion and soothe spasm and cramps, and alleviate pain. This tea promotes the production of bile to help speed up digestion. Note: to achieve the best results, it is best to have a cup of peppermint tea about 30 minutes before your meal. Drinking this tea may also calm your stomach when you are suffering from seasickness or nausea. Menthol is believed to have an analgesic effect on the nerve endings of the stomach, reducing the urge to vomit. This herbal tea may also treat issues in the intestinal tract, so you may drink this tea when you suffer from intestinal colic and soothe the symptoms of irritable bowel syndrome or diarrhea. It may help fight flatulence, bloating, constipation and diverticulitis. This tea may also be used to help dissolve gallstones or treat gastric ulcers by better protecting the lining of your digestive tract. However, be aware that if you are taking medication for these conditions. Peppermint tea may also be helpful for children with digestive problems, but make sure to talk to your child's doctor to make sure it is appropriate for your child's ailment and how to best adapt the tea to the child's weight. By improving your digestion, this tea may also help you lose weight. Peppermint is said to boost your metabolic rate, thus helping to promote the proper absorption of nutrients and faster removal of accumulated wastes. Improved production of bile may help to break up fats faster. It also helps to suppress appetite, giving you back control over the urge to eat more than you need. At the same time if may also serve as a great treat to have after a meal instead of a dessert. You may use this tea to help soothe a toothache. It is not only refreshing, but also antiseptic and anesthetic: it may treat and numb the pain. It is said that this tea promotes dental health, helping to prevent dental plaque or cavities. The antiseptic action of peppermint tea may help to treat and ward off infection in the mouth. Bacteria are often the source of bad breath, so drinking this tea is not only refreshing but also lead to good and fresh breath. Make the most of the menthol flavor of this tea and drink or gargle it to improve your breath. A cup of peppermint tea is caffeine free and may be taken to calm the nerves and relieve stress and anxiety. The menthol content in peppermint is said to reduce mental stress, allowing your mind to unwind and relax, without knocking you out completely. Drinking this tea may help soothe nervous disorders and bouts of hysteria. It may also be helpful when you are suffering from insomnia and have difficulty sleeping or experience restless sleep. At the same time, peppermint tea in considered a revitalizing tea. It may be used to create a stimulating bath leaving you feeling renewed and refreshed. This herbal tea may function as a muscle relaxant, alleviating pain and the anxiety related to it. It may also bring relief to migraines and tension headaches, by easing pressure on constricted brain blood vessels, reducing pain and discomfort. The possible analgesic properties may also provide some relief for those dealing with chronic pain or sciatic pain. Are you facing an exam and can't study? Do you have a project to deliver but can't concentrate? Then try drinking peppermint tea. This herbal infusion is said to boost focus, alertness and concentration. This minty brain tonic may help to boost your mental performance while helping your memory to better store information. It also helps you to stay calm, something that is greatly needed when you have to concentrate. So don't panic, you will be fine! Peppermint tea is considered a cure-all due to its antibacterial and anti-inflammatory properties. It is rich in many elements that may boost your immune system and increase your defenses against disease. Drinking this herbal tea may be a way of nourishing your body, speeding up recovery time when you are ill or simply by reducing the chances of getting sick in the first place. The antioxidants in this herb help create a tea that may prevent serious diseases or the side effects of their treatment. For example, this tea may help prevent or reduce the severity of such diseases as herpes outbreaks, hepatitis A virus, or inflamed joints and arthritis. One of the benefits of peppermint tea may be its ability to treat the liver, nourishing and treating the organ that is responsible for hormone production and balance of the body as a whole. Balanced hormonal production is essential for women who tend to suffer from menstrual cramps or PMS. This nourishing herbal tea may also provide pain and stress relief during these times. Its high calcium content may relieve uterine congestions or cramps, which is great for women with delayed periods. Drink a cup of tea in the 2 to 3 days before your period is set to begin and this peppermint infusion may offer some relief during this stage. A tea made from peppermint leaves is considered refreshing and cooling. This could be ideal for women who are going through menopause and who are experiencing hot flashes. At the same time, it may help your mood swings and feelings of anxiety. Using peppermint tea on your skin either in bath form or by dabbing it on your skin, could be very refreshing on hot days and at the same time, it may be used for its antiseptic action, cleaning the skin of acne or other skin ailments. 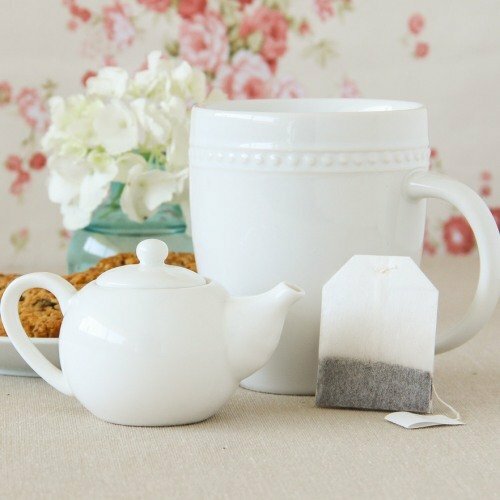 This calming tea may help soothe burns, irritation caused by insect bites, poison ivy, rashes, cracked skin or inflammation, but remember to test the infusion on a small portion of the affected skin. Soaking in a bath with peppermint tea may help you feel fresh, sedated and smelling wonderfully. This could be helpful for those who suffer from bad foot odor, as the tea may be attacking the bacteria causing the problem. Using this tea as a hair rinse could possibly benefit your scalp. Its cooling and disinfectant action could help you deal with such issues as dandruff or lice. It may also nourish your hair and some believe that it may stimulate hair growth. Add a minty flavor to your life now! Peppermint tea is a well-known cure-all, but at the same time there are a few things you should be aware of before taking this tea medicinally. This herb is considered generally safer and unwanted side effects are extremely rare, but there are a few occasions when this herb should be avoided. 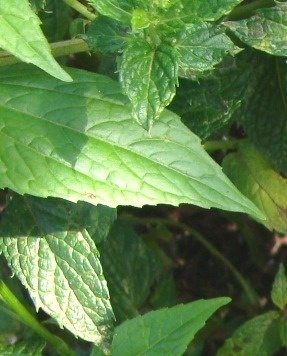 Although extremely rare, some people may be allergic to menthol, an important component present in peppermint leaves. Symptoms of allergy may be heartburn, headaches, lightheadedness, or slowed heart rate. It is best to stop drinking this tea and talk to a doctor about these symptoms. When applying peppermint tea topically, allergic reactions may take the form of rashes or sores. To be on the safe side it is best to test this tea on a small area of your skin to assess your reaction to it. Drinking peppermint leaf tea should be safe in most cases. However, refrain from making tea with peppermint oil or extract because too much may be toxic for your body. To be on the safe side, stay within the daily recommended amounts or 3 cups a day at the most, for a period of 8 weeks at most, but take a break every few days. Rare side effects of too much peppermint may be cramping, diarrhea, slow heart rate, drowsiness or muscle pain. If you have suffered from gallstones in the past, it is best to talk to your doctor before drinking this tea as peppermint tea may enhance the effects of the medication you are taking. If you are taking any form of medication, then you should be aware that this herbal tea may enhance or hinder the effects of your prescription drugs. You may talk to your doctor about the possibility of adapting your dosage to include peppermint in your diet, especially if you are taking stomach, diabetes or blood pressure medication. Drinking this herbal infusion while you are pregnant is not advisable. It is said that peppermint tea in large amounts may increase the risk of miscarriage by stimulating the uterus. This may be particularly important for those with a history of miscarriages or going through a risky pregnancy. Doctors also do not advise drinking this tea while breastfeeding an infant as the mint oils released into the tea is considered to be harmful for babies or small children. Talk to your child’s doctor for more information. This tea should also be avoided by those with a history of heart disease or who are being treated for diabetes, due to possible interactions with medication. Peppermint tea could limit your body’s ability to process the medication or enhance their effects to a dangerous level. Peppermint tea may be ideal to treat stomach problems, but as it may relax the esophageal valve that leads to the stomach, those who suffer from GERD – gastroesophageal reflux disease – or a hiatal hernia should avoid this tea to prevent painful acid reflux. Peppermint may interact with some prescription medications, particularly those that are broken down by the liver. This herbal tea may decrease how well the liver processes the medication, possibly increasing some of its side effects. It is best to check with your doctor before taking this medicinal tea. This is a great tea to enjoy whether you are sick or simply want something delicious to drink. Let's learn how to make peppermint tea. 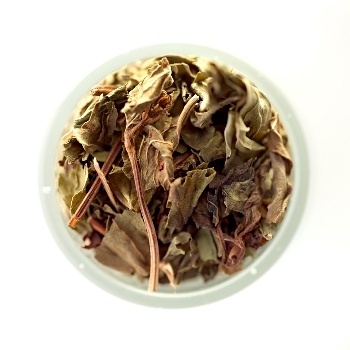 Peppermint tea is made using either fresh or dried leaves or flowers of the herb. Fresh leaves are more flavorful than the dried form. This herb is easy to grow in your garden or in a pot at home, just as long as it gets plenty of sun and you water it frequently. When picking your peppermint, make sure to wash the leaves thoroughly. If you are using fresh leaves to make your peppermint tea, then chop and crush about 1 tablespoon of fresh leaves per cup of water. Chopping or crushing the leaves will allow the medicinal oils of the herb to be released faster into your tea. On the other hand, if you are using the dried form of peppermint, then use about 1 teaspoon of dried leaves per cup of water. Place the amount of herb needed inside a teapot. Heat water until it reaches boiling point and then pour it into your teapot over the peppermint leaves. Allow your tea to steep for about 5 to 10 minutes. The longer you steep the tea, the stronger it will be and taste. Strain and drink. You may sweeten your tea with honey or add some zest by squeezing some lemon juice into your cup. This is particularly good when you are treating a cold. Drink about 3 cups per day. If you are taking this tea medicinally remember to stop for a few days after every full week of enjoying this tea. Allow your body to adjust and test to see if you still need to drink as much peppermint tea. This is a soothing tea with a refreshing taste and aroma that may be enjoyed before, during or after your meals. When purchasing fresh mint, make sure the leaves are bright and unblemished. These may be kept in the refrigerator for about a week, so do not buy more than you plan to consume or it lose its freshness. You may also consider buying a potted plant and have peppermint available whenever you need it. Try adding freshly brewed peppermint tea to your bathwater for a refreshing and cleaning sensation. Apply this tea to your skin using a washcloth, but remember to test first on a small area of your skin to make sure that you are not allergic to it. Blend peppermint with lavender to create a relaxing blend. Mix with fennel seeds for a detox infusion or with ginger to promote a healthy digestion. Also this herb is ideal to blend with other less flavorful infusions, creating a harmonious and balanced flavor without overpowering the whole blend. If you blend peppermint with spearmint, the resulting infusion is called “double mint tea” and is considered a very soothing and relaxing blend. Peppermint is a key ingredient in Moroccan green tea. This traditional tea is made by blending peppermint leaves with gunpowder tea. It is a great way to add a burst of freshness and flavor to green tea without resorting to sweeteners. Iced peppermint tea is delicious and ideal to be served on a hot summer day. It is naturally refreshing and its minty flavor blends perfectly with many citrus fruits creating an amazing iced tea. How to make peppermint iced tea? It is really easy to make this tea. Just make your regular cup of hot peppermint tea and then pour into a tall glass filled with ice. If you preparing this iced tea ahead of time you may chill it to enjoy later. Just remember to allow you tea to cool down to room temperature before putting in the refrigerator so as not to increase the temperature inside. Add a citrusy touch to your iced tea my adding a bit of lemon, orange or lime juice. Alternatively you may add slices of these fruits instead of just the splash of juice. Experiment and find out what flavors you like best. If you must, add a bit of honey to sweeten your drink. Buy Your Peppermint Tea Today! Click on the image or on the links below to purchase from Starwest Botanicals your organic peppermint. Every home should have peppermint available all year-round. 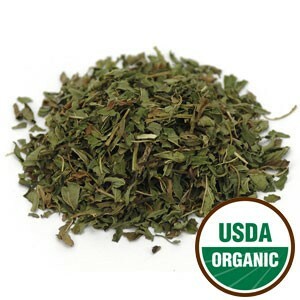 Quickly brew your tea with these organic leaves and have a nice cup of comforting and healing tea. Peppermint is a wonderful herb and very resilient. It is ideal to have at home to quickly fight a cold or indigestion, or just as a nice decorative plant. Go ahead and add a bit of a refreshing flavor to your life with this incredibly healing herbal infusion. 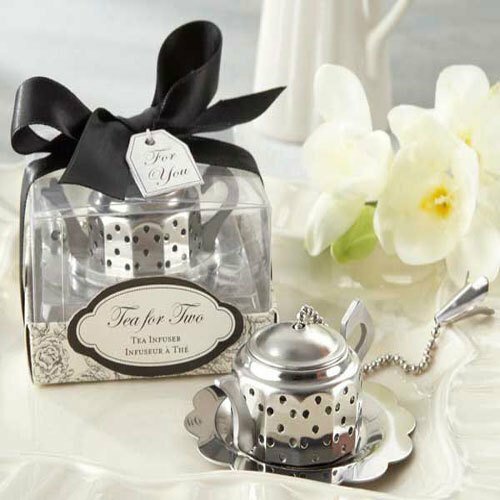 Relax and enjoy a minty cup of tea!